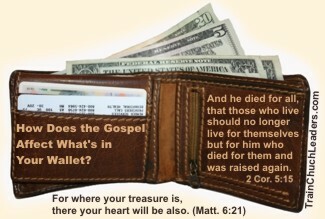 What would the Gospel have to do with the church budget? The obvious response would be that we allocate funds for outreach to share the Gospel with others, making sure our finances are used for more than paying salaries, facilities, and utilities. While that is true, a better response might be that the Gospel propels giving in the Church. We no longer live for self but for Him who died for us. Consequently, stingy and self-centered living changes to generous giving “not reluctantly or under compulsion, for God loves a cheerful giver” (2 Cor. 9:7). It’s the logical response to a God who loves us so much He sent His only Son to die for us. When giving is down in the Church, perhaps it is a sign that we need to get back to the cross. The absence of the qualities that lead to generous giving (faith, goodness, knowledge, self-control, perseverance, godliness, mutual affection, love) suggest that we have forgotten the power of the Gospel. When we forget about that indescribable gift — Jesus, dying on the cross in our place, we will be less prone to use our money for outreach in sharing the Gospel with others. We will tend to be less generous givers. Our perspective becomes worldly. Our motivation becomes self-centered. Next → Next post: Grace Bookend Your Change Process?